The glorious colors of fall foliage in New England and the aromas of the season make Columbus Day weekend a perfect time to visit Granville and experience our annual Harvest Fair. Coming through the Granville Gorge from Southwick on Rt. 57, you arrive at the Village School. Park your car there; spend some time in the school shopping at the Crafts Vendors and sample tasty foods. Outside, a Shuttle Bus awaits you for the short ride to the Library where there is a Giant Book Sale; vendors fill the lawn. Next door is the Federated Church with more crafters, food and a quiet sanctuary for rest. Across the road is the Town Green. There are activities for kids, food to enjoy, and vendors to visit. Beyond the church and a short walk or bus ride up Water Street is the Noble & Cooley Drum Shop. This 1854 factory is still making drums for today’s musicians. It houses the Noble & Cooley Center for Historic Preservation. There will be a blacksmith shop, a beer garden, and crafts. Return to the Shuttle Bus and ride up the hill to The 1802 Meeting House. On the lawn are the Annual Scarecrow Convention and a display of Vintage Tractors. Inside this historic building is the beautiful display of quilts made by members of the Granville Quilt & Needlework Guild. Handmade/Homemade items are there for you to purchase from the various crafters. Relax, eat a slice of hot Apple Pie with Cheese, and enjoy a cup of homemade soup. You may choose to leave your car at the Town Hall where additional parking is available, ride one of the yellow shuttle buses, and partake of the fair’s adventures in the other direction. The Town Hall lot is just up the road from the Old Meeting House. 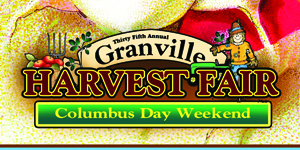 We look forward to seeing the many visitors to the Granville Harvest Fair. Questions are welcome at Town Hall 413-357-8585. « September 1963 by Clifton (Jerry) Noble, Sr.